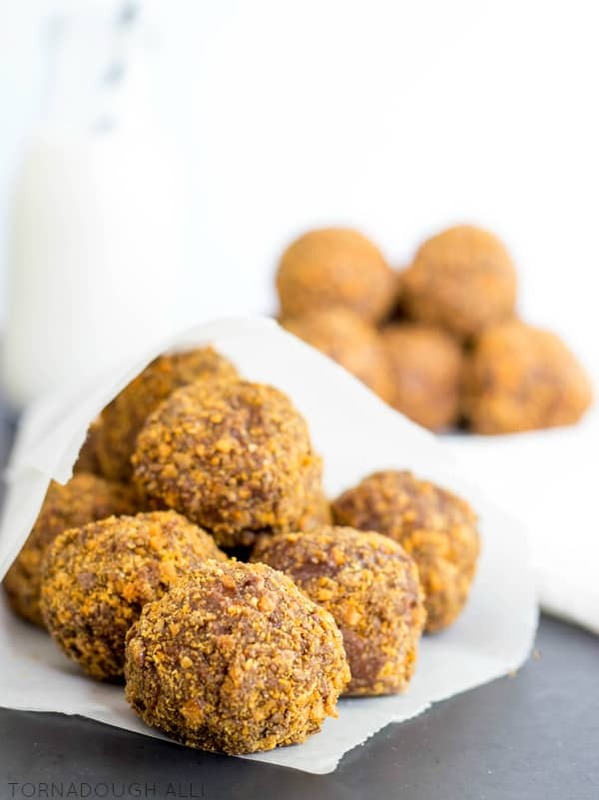 Decadent cake donuts dipped in creamy chocolate poured glaze and coated with delicious crushed Butterfinger bites make these Butterfinger Donut Holes a great popable treat! Honestly, I thought it would be awhile before I shared another donut recipe with you. But do these really qualify as donuts? I mean there more of a little ball of delicious goodness. Technically donuts are delicious goodness as well, and they are qualified as hand-held to…oh heck, I just can’t help myself. You guy’s know my love of donuts thus far, can’t stop, wont stop is all I can say to that. But for real, these babies are EPIC. I mean EEEPPPPIIIICCCC. I know it’s the Pringles slogan, but it should be for these, because once you pop, you can’t stop. They are so addicting. If the word Butterfinger doesn’t do it for you, how about poured chocolate glaze. Like the kind that they use on Texas Sheet Cake. Yup, these have it. Oh and did I mention that they are baked, and no special equipment needed? Sure if you have a donut hold maker, by all means, use it. 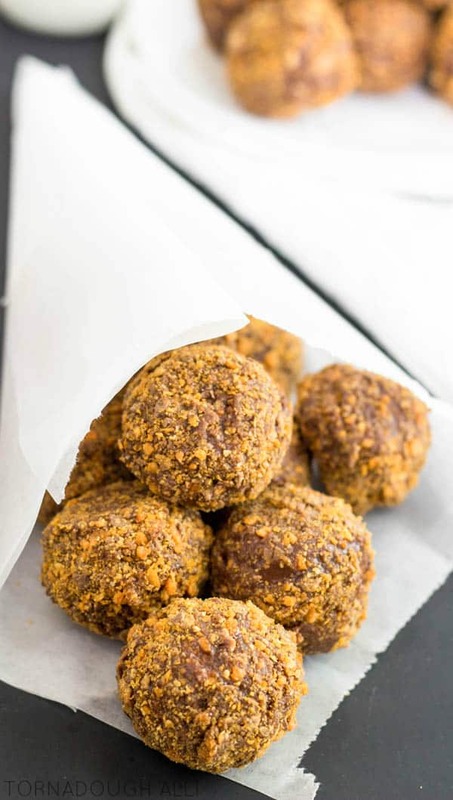 But these Donut Holes can be made in a mini muffin tin! How simple is that? I mean, you have to go make them now. What is stopping you? I should say willpower to not eat all in one sitting, but that all but went out the window when these things made an appearance. I was doing so good too! 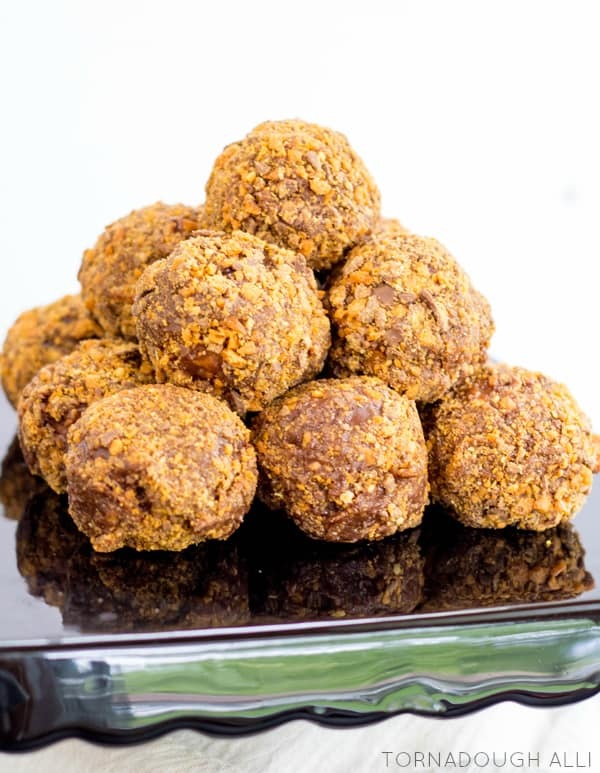 These come in an easy 4 step process, bake, dip, toss, DEVOUR. I suppose you could let them set up for a bit, but trust me, it’s hard. Like really hard. So if you are trying to watch your weight, maybe this post isn’t for you…but that’s what they call a cheat day right? No? That’s just something I do? Whoops…. Any who, 3 words to end this rant for you…GO, MAKE, NOW…oh and save some for me. Spray a 24 count mini muffin pan with non-stick cooking spray and set aside. In medium bowl, mix together your flour, baking powder, salt and sugar until combined. Add your batter to a piping bag or a ziploc bag with the tip cut off and pipe muffin cups about 1/2 full of batter. Bake for about 10 minutes or until lightly golden, remove from oven and let cool. Meanwhile on stove in saucepan melt your butter, remove from heat and stir in your cocoa powder, vanilla and milk until combined. Slowly whisk in your powdered sugar until there is no lumps. 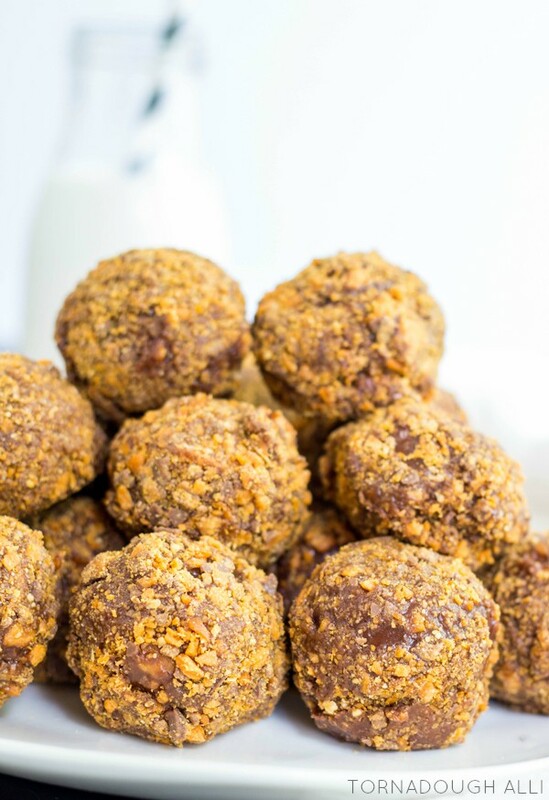 Add your crushed Butterfingers to a small bowl. 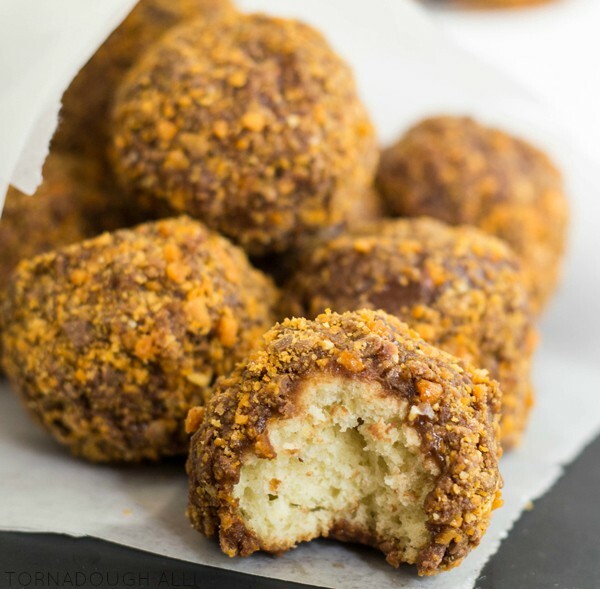 Dip each of your donut holes into glaze then shake in crushed Butterfingers. Let set for about 10-15 minutes to harden up. YUM! These look awesome! What a fun treat! We are having a 90th birthday celebration for my MIL in June so these would be perfect for the afternoon tea we have planned. Thank you for sharing with us at Over the Moon. These are perfect for an afternoon tea!! Great little treats that everyone will enjoy. These look CRAZY delicious! I love Butterfingers! I agree, easy treat plus super addicting are a recipe for disaster! 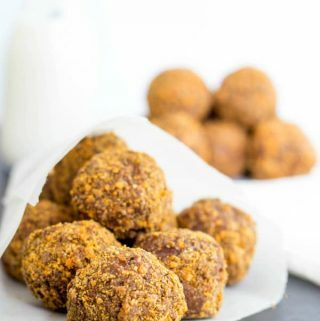 I love little donut holes and these bites look so delicious. Um… YUM!!! Definitely pinning these, they look crazy delicious! ??? ?